I was mentally prepared to give my kidney to my son William. I had been a donor for at least 15 years since I was told as a child that if my brother's one kidney ever failed, that an immediate family might be asked for a work up. My brother is doing fine on his one remaining kidney and was the first family member from my side to meet William. Uncle Mark was going to give his nephew music lessons. I looked forward to my kidney being removed from my body, for then my son would not have to be on dialysis everyday at home (peritoneal). My son William was called Home by God before my son had gained the required weight to be able to fit an adult sized kidney. William was flown to Heaven by his brother, Joseph, when William was 7 months old. We begged to be able to donate William's organs when the decision had to be made to turn off his life support when there was no more hope. But, we were told that the time spent on full life support had rendered all organs (including corneas and heart valves) useless for donation. We did have the organ donation organization set up a booth with donor cards, and other items promoting donation at William's service. 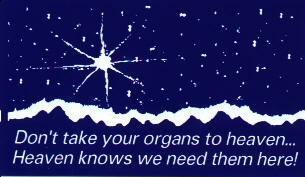 Please don't take your organs to Heaven, Heaven knows we need them here on earth. Children need organs too! Please donate! That's all about William for this page, for more about William...check out his page by clicking on his name or follow the navigation box at the bottom. Of course you will cry, but you will laugh and smile a few times and you will find a link to see my sweet William's pictures...well worth the trip! At the hospital that I work for, we ask questions such as, "Do you have a living will? ", "Have you appointed anyone as having power of attorney to make decisions for you should you become unable to make them for yourself? ", and even, "Are you now, or have you been abused in the last year, and do you know of a safe place to go to in case you needed to?" I myself have been admitted to my hospital three times over the last three years for various surgeries and have been asked these questions in my admission assessment. But, I have never been asked as a patient, nor have I asked this as an admitting nurse, "Are you an organ donor? If not, do you wish to recieve the papers should you wish to become one?" On my most frequent surgery (left arthroscopic knee surgery), I told my pre-op nurse that I was a donor and how come they did not ask about this? She stated that it was a very valid question. Now, I wish to find out from all of you that view this page, have you ever been asked this upon admittance to a hospital in the last five to ten years? If your child has been hospitalized, you may answer for them as well. The below poll will allow you to vote, see the results of other voters, and then return to this page afterwards. Thanks so much for your cooperation. Have you been asked if you are an organ donor during a hospital admission? Submit prayer requests for sick, chronic, critical, and terminal children. WebTV and Lower Browsers please use this link to submit prayer requests for children. The praying hands will take you to the webpage submissions for children needing prayers that have webpages. The message forum is for children needing our prayers that do not have webpages. Thanks and God Bless. Transplantation saves lives, but only if you help. All you need to do is say yes to organ and tissue donation on your donor card and/or drivers license, and discuss your decision with your family. Each day about 57 people receive an organ transplant, but another 13 people on the waiting list die because not enough organs are available. 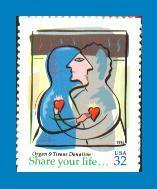 Talk to your family about organ and tissue donation, so they know your wishes. Even if you've signed something, your family will be asked to give the consent before the donation can occur. You could help up to 50 people if you decide to donate your organs and tissue. Your Heart could beat for someone else. Your Lungs could breath for someone else. Your Kidneys could free two people from dialysis. Your Liver could save the life of a person awaiting transplantation. Your Corneas could give sight to two people. Your Bones could help repair other people's damaged joints. Your Skin could help heal many burn victims. My son required periodic baby sized transfusions based off of his condition. Since I had him by c/sect, I was unable to donate blood at all for 6 weeks, and then I had to have the required amount of hematocrit so that I would not become too weak. At about 7 weeks after my surgery, he needed some more blood again. I desperately wanted him to have my blood. The hospital (a very good one) agreed to try to hold off on the transfusion till I could see if I were allowed to donate based off of my hematocrit levels. I went to the main donation center in Houston and told them our story. They said that if I qualified, that they would try to put a rush on the processing of my donated blood, considering the extreme circumstances. I got a double page while I was there, as any parent with a child in the hospital, you know how much this scares us. I returned the call immediately and it was my son's nephrologist (kidney specialist). He frantically asked if I had donated my blood in my son's name yet, and I told him no, that I was about to start pending my hematocrit test results that they were about to start. He told me that if I donated my blood to my son, that would totally disqualify me as a potential kidney donor. And since they knew I was CMV (cytomegalo virus) free, that placed me high on the potential list of family donors, and to NOT donate my blood to him, for he would develop antibodies to my blood that would cause the future kidney (if it were mine) to instantly reject because of the antibodies formed from the blood donation. (*CMV is a virus that many people have, it's symptoms are rather minor, like a very weak flu. But, in addition to the possible birth defects that it can cause if it were to become active in a pregnant women, it could also cause the kidney to reject if it were passed on from transplant. Based on what the doctor's told me, the CMV based rejection was not a direct type of rejection, but still had dire effects. So, in kidney transplant workups, the donor, living or cadaver, is supposed to be CMV free in their CMV antibody tests of the blood. I do not know how other organ that are donated are affected by the CMV virus. If someone knows, please write me with the information so I can update this part*) Myself (as a nurse), my son's nurses and non renal specialist doctors, my coworkers, (both doctors and nurses), had barely heard about the blood donations disqulalifying a family member from being a living donor, hence the reason for this warning, if that many medically trained people had not heard, then I wanted to educate as many about this as possible. I was already at the donor place, so I went ahead and donated like I had in the past and asked that a note was placed on the bags that my son at such and such hospital was NOT to recieve this blood under any circumstances. After I donated, I returned to visit with my son at the NICU, and called from his crib to inform his grandmother that I had donated but he was not to recieve my blood and the reason why. Grandma Judy called her daughter about this, William's aunt told her coworker what had happened. Her coworker called her husband, and by the next morning, approximately 40-45 units of blood had been donated in my William's name by the hero's of The United States Coast Guard! The United States Coast Guard!! click on the piano to hear more of his exquisite music.